At Plan B We're involved in a number of music related projects just now with WinterStorm (our rock festival), South Beach Sessions (a series of acoustic and blues rock gigs) and a new Punk/Indie weekender in the planning for August 2017. As a result of this we have been involved increasingly with gigs, musicians and artistes over the past year. We have also found ourselves being much more proactive on Facebook with the promotion of these events to the targeted niche audiences that our events are aimed at. What has become increasingly obvious however is that despite the fact that most businesses are on Facebook they ignore some of the very tools that can work best for them. Events is the example that I am talking about in this context. As part of a wider "One Ayrshire" destination marketing project we have been setting up the background info for a One Ayrshire events page on Facebook and the new website in turn and it has opened our eyes to the number of businesses simply neglecting their own and the local events on in the area. Sharing events on your own Facebook page should be a given. It is not only simple to do but can drive traffic back to your own web page and booking link as well. It will not fill your venue on its own but if you have a Facebook page use the bloody assets on it! As an events listing it covers everything from header image, venue, dates. times, description, prices and links to web page and ticket links too. Not only that you can then invite your friends to attend and you can "Share Events" with appropriate partners and collaborators locally. Once you've created your event you need to get it out there. You cannot assume that anyone is looking for it so you have to take it to them. That's how Facebook works, you need to get down and dirty and start looking for Businesses, Groups and conversations that will be interested in your offering - and this doesn't just apply to events. For WinterStorm (a classic rock weekend) we started sharing events and posts with heavy metal, rock and blues Groups that we joined. We shared with Motorcycle Groups and other genre relate pages, we shared the events with local businesses involved in tourism and on every band page performing. We were to use that awful phrase, "fishing where the fishes were" - we were engaging in conversations with people who we already knew had an interest in the subject and we took our message to them rather than waiting for them to stumble upon us. The results were quite incredible with an incredibly launch period and the very quick creation of "brand awareness" and a 30 second teaser video that was viewed more than 12,000 times. If you have a series of music events then let the local accommodation providers know and share with community groups and business associations - those hospitality businesses should be taking your events and adding them to their own pages as part of their own marketing strategies.let them know what you've got on and encourage them to talk about it. "If you're coming to Scotland in November what about booking with our hotel in Troon. For rock fans we have a two day event taking place just up the road in the Concert Hall featuring world class bands. Click on the Event below for ticket information and book direct online at our website"
It makes sense doesn't it? You have a hotel with rooms to sell in late November so why would you not add EVERY local events that's taking place onto your own business page. 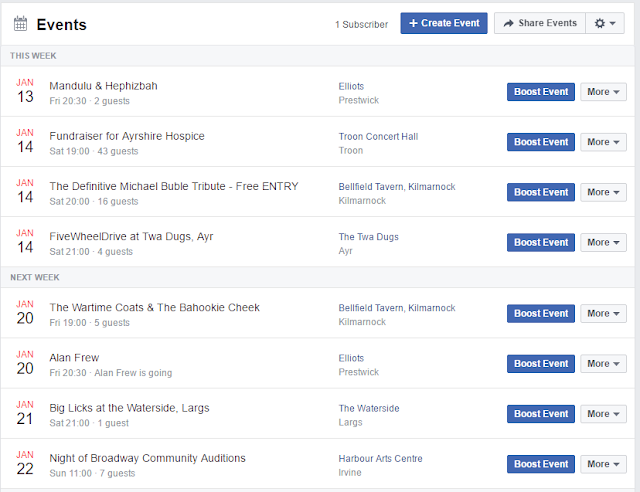 Easy to do as well - click on the Events page, open the event and click on the three dots top right - the drop down will say "Add to Page" - simply select your own page and it will magically be on your events listing. All hoteliers, all accommodation providers, all hospitality businesses should understand that it is this simple power to share and collaborate that is the real strength of social media. It engages the visitor and gives them additional reasons to come to your area. If every destination could get everyone collaborating at even the simplest of levels such as this there is little doubt that real benefits would accrue. It's not just Ayrshire for sure but that happens to be what I'm working on just now and it's pretty unbelievable how totally neglected the events listing actually is. The Gaiety, Ayr Racecourse, South Ayrshire Events, The Palace Theatre, smaller venues, larger venues... All have lists of previous events and not one of them has a list of what's forthcoming. I am not a flag bearer for Facebook as a wonderful business tool - far from it - but it is a truism that you will only get out what you put in. And if you put in nothing you cannot expect to be found. Facebook, like your website requires content; content requires commitment, and then and only then will that content convert. If you have twenty events in place for the next year get them into your Facebook page. If you don't know how to do it then make a member of your staff an author on your business page and get them to do it for you. As I still have a tendency to say, "There's now way but the hard way so get used to it". For help with Developing your Relationships drop us an email or call us on 01294 233713.